Contains 0.5 fl. oz. (15mL) vial of injectible insecticide, one syringe and one syringe tip. Treats 1 large tree (60" in circumference) or numerous smaller trees. Multi-Insect Killer Tree Injection Kit (formerly Pointer) is designed to allow homeowners to effectively treat trees of any size with systemic insecticide. It is especially useful in situations where foliar spraying is not feasible. Controls Adelgids (including Hemlock Woolly Adelgids), Aphids, Asiatic Garden Beetles, Black Vine Weevil Larvae, Chafers, Elm Leaf Beetles, Eucalyptus Longhorned Beetles, flathead borers (such as Alder-Birch Borers, Bronze Birch Borers and Emerald Ash Borers), Japanese beetles, Lacebugs, Leafhoppers, Leafminers, Mealybugs, Oriental Beetles, Psyllids, Royal Palm Bugs, Soft Scale Insects, Thrips (suppression) and Whiteflies on all types of ornamental trees. In general, one application gives season-long control and control of pests can start to be seen within two weeks. Multi-Insect Killer contains an insecticide that is deposited into holes drilled into the tree trunk at the root flares (where the trunk begins to 'flare out' at ground level). This simple application method is both easy and convenient. Also, damage to the tree is minimized due to the needle-like design of the ampules. Treat trees anytime during the growing season. Treatments earlier in the growing season are more successful. As a preventative, apply in early spring prior to insect activity in the tree; one application provides full-season control. To kill insects already on a tree, apply in spring through fall more than one application may be needed depending on the infestation. The active ingredient is Merit® (Imidacloprid). 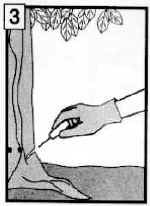 Use the syringe to deposit insecticide into holes drilled around the base of the tree. 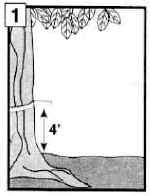 Measure the circumference of the tree within 12 inches of the ground. 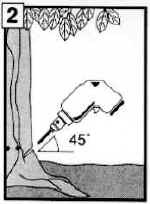 Drill 1/2-inch-deep holes into the tree at the flare of the roots. Evenly space holes around the tree every 4-6 inches. Inject prescribed amount of insecticide into each hole. One Multi-Insect Killer Tree Injection Kit contains enough insecticide for 15 application sites and can treat from fifteen 4" circumference trees to one 60" tree. Treatments are more effective early in the growing season. This treatment should NOT be applied to food-bearing plants. Injections to conifers may be either slow in uptake or have no uptake at all. Even though Multi-Insect Killer Tree Injection calls for very small holes to be drilled, all holes are wounds. Holes should not be drilled in a tree more than once a year. Holes should also not be drilled in more than two consecutive years.